The blenders that we will compare in this article belong to a special class of high-powered multi-function countertop blenders. Though they cost a lot more than the average blenders most people buy, they are the preferred blender choice for people who take cooking seriously and aspire to cook like a chef. These high-powered blenders have been specifically engineered to withstand years of daily use in commercial and home kitchens. ​The various parts (jug, blades, motor, etc.) are made of superior quality materials that will last a very long time if properly maintained. They have pre-programmed blending cycle selections for various preparations such as smoothies, purées, frozen desserts and even hot soups. They come with a recipe book that describe in detail the various preparations you can make using the pre-programmed selections. They are equipped with manual speed selection dials or buttons that allow you to experiment with your own recipes when the pre-programmed selections are not used. Some have timers that allow you to set the blending time. Some are equipped with an LCD screen that shows you various data related to the current blending operation, such as the remaining blending time, the selected speed level, or the type of operation selected. These blenders are the best available in their superior blender categroy and have received mostly excellent reviews from Amazon customers (at the time this article was written each had received an average rating of no less than 4.5 stars - the maximum being 5 stars). The Blendtec Total Blender can accommodate both Blendtec's WildSide and FourSide jugs. While the FourSide jug has four sides as described by its name, the WildSide jug has a wide base and a narrow fifth side, or “wild” side, that changes the angle of the blending vortex. As a result, frozen ingredients are far less likely to form a cave above the blade. This makes the WildSide jug great for large, cold recipes as well as more specialized blends, like bread dough. Both types of Blendtec jugs are offered below in the Amazon products section. ​Pre-programmed blend cycles are carefully designed and selected to produce optimum results for a wide range of blending tasks. When none of the pre-programmed settings are used, both blenders allow manual selection of the blending speed. This is achieved using either a dial (as in the case of Vitamix), or buttons (as in the case of Blendtec) from their respective control panels. On Blendtec Total Blender, the illuminated LCD timer displays the remaining blending time when a pre-programmed cycle is selected. Though Blendtec Total Blender does not have an explicit auto-clean mode, cleaning it is very easy. It is recommended to put a drop of liquid soap and some water into the jug, pulse it and then rinse. In the following sections below, we will describe each blender in more detail. Vitamix Professional 750 is equipped with a BPA free 64-ounce jug that is perfect for preparing various family meals and entertaining, while fitting comfortably under most kitchen cabinets. The commercial-grade 2.2 horse-power motor, together with the laser-cut, stainless-steel hammermill and cutting blades, can easily blend the toughest ingredients. The blender is equipped with 5 pre-programmed settings, 4 of which are for preparing recipes while the 5th is for automatic cleanup. There are also explicit On/Off and Start/Stop switches, a variable speed dial and a pulse switch. The 4 pre-programmed recipe settings are for smoothies, hot soups, frozen desserts and purées . To operate all you need to do is turn on the machine, select either a pre-programmed setting or a particular speed from the variable speed dial, and press on the Start button. The 4 pre-programmed recipe settings automatically handle smoothies, hot soups, frozen desserts and purées with consistent results. The responsive controls let you adjust the texture of every blend. Programs can be interrupted by pushing down the start/stop switch at any time. If reactivated by pushing down the Start/Stop switch, the program will start at the beginning. The self-cleaning setting, when used together with a drop of dish soap and warm water, will make the machine clean itself in less than a minute. The Blendtec Total Blender is equipped with a BPA free 64-ounce jug which is exceptionally light even though it is made of extra-strong jug material. Note that while the jug is marked only up to the 32-ounce level, it can hold 64 ounces (the upper section of the jug is not marked). The smaller size and low profile of this blender mean that you can easily store it in plain sight, on your countertop. Equipped with a 3hp motor, it's the most powerful blender available for home use, and together with the ultra-hard stainless steel blades that are cold-forged and tuned for heavy use, the machine can easily blend the toughest ingredients. Note that the blades have Blendtec's patented vertical wingtips and precision angles which are engineered for ultimate efficiency. The Blendtec Total Blender can accommodate both Blendtec's WildSide and FourSide jugs. While the FourSide jug has four sides as its name says, the WildSide jug has a wide base and a narrow fifth side, or “wild” side, that changes the angle of the blending vortex. As a result, frozen ingredients are far less likely to form a cave above the blade. This makes the WildSide jug great for large, cold recipes as well as more specialized blends, like bread dough. Note that Blendtec Total Blenders with both types of jugs can be found in the Amazon products section below. The control panel is equipped with six touch-pad buttons to invoke six pre-programmed settings that activate blending cycles to handle automatically smoothies, fresh juice, ice cream, frozen yogurt, milkshakes, soups, sauces, batters, dips, salsas and more. There is also pulse button and two speed control buttons. The speed buttons allow you to manually control the blender and choose any of the available 10 speed settings. Once you select a speed, the blender will begin to run at the selected speed, and then shut off automatically after 50 seconds. You can also stop the cycle before the 50 seconds by pressing any button on the lower row. Note that unlike the Vitamix, this machine does not have explicit Start/Stop buttons. So, which of these two high-powered blenders to buy? The two blenders considered here are excellent products as shown by the average rating each had received from Amazon customers at the time this article was written. Indeed, as mentioned above, both had received 4.5 stars (out of 5 stars). Therefore, is a good chance that you would be quite happy with either of these two blenders. First, note that Blendtec Total Blender provides more pre-programmed selections than the other two brands. For instance, the Blendtec machine has separate pre-programmed selections for Milkshakes and Smoothies, while the Vitamix machine has a selection for Smoothies, but none for Milkshakes. Clearly, that doesn't mean that you will not be able to prepare a milkshake using the Vitamix machine. It simply means that, with Blendtec Total Blender, you will be able to prepare the "perfect" milkshake with less experimenting or guess work. 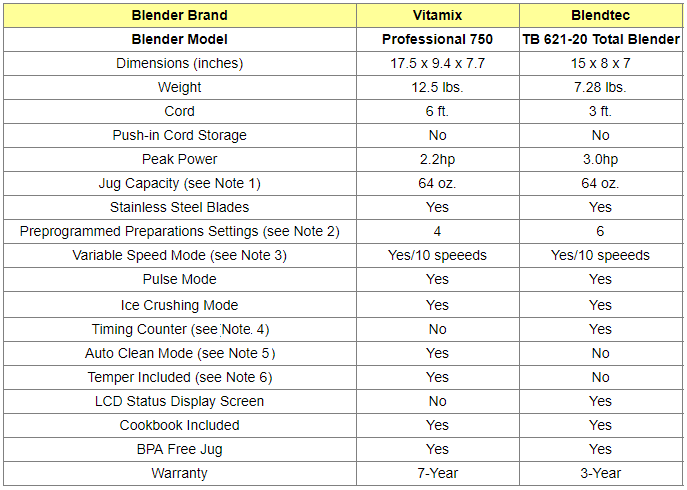 Note also that though Blendtec Total Blender is smaller than the Vitamix, it has a more powerful motor at 3.0 hp. The Vitamix machine come with a temper that allows acceleration of the blending process of very thick and/or frozen mixtures. Finally note that both Vitamix offers a 7-year warranty, while Blendtec provides a 3-year warranty.